Unless you are already a Pro at binoculars and have developed a taste for some type of brands only, if not you will agree with me that choosing the right binoculars is a tedious task. The problem is there are many manufacturers in the market and getting the best binoculars for the money can take some time and research. Furthermore, every now and then new models are released and its hard to make a decision on which one sometimes. If you are like me, I always want to get the best value for my money. Not only that but sometimes you are on a tight budget which puts a limit on how much you can spend on these devices. After long hours of research and taking into consideration users feedback, I have come up with the best value binoculars to add to your outdoor adventure list. Let us look at what to look for when choosing binoculars for those who may not already know. Here are the specifications you need to look at when selecting the best binoculars. They are guides to help you choose the pair that you will enjoy using for a long time. The magnifying power of the binoculars is how much bigger it makes the target you are looking at appear. Even though by this saying some people may think – ohk that mean I have to choose the highest magnification I can possibly find in the market, it all depends on what you are using them for. also keep in mind that the higher the magnification, the narrow your field of view will be. The binocular magnification and its objective lens size are typically found printed on either the body or the focus wheel of the binoculars. An example of such a pair of numbers: “8×42”. the magnification for such binocular is the “8×”. This means the target object will appear eight times bigger than your naked eyes would have seen. One thing to keep in mind when choosing binoculars is that binocular magnification from any number up to 10 times is easier to hold with hands and still get a steady image. But if you go for magnification higher than 10, you have to consider a tripod or they must be image stabilized, because, the higher the magnification, the more amplified body movements like handshakes become thereby producing unsteady images. This number is usually quoted hand in hand with the magnification. From the example above, the objective lens size is the “42”. This number is indicated in millimeters. The objective lens diameter tells you how much light the binocular can gather from the target – It is the light gathering ability of the binocular. The more lights the binocular can gather from the target, the brighter, clearer and crisp the image will appear. This means that the bigger the objective lens, the more lights it will be able to collect. The downside of bigger objective lens size is that it makes the binoculars heavy and bulky. The field of view tells how much area you can see when you look through the binoculars. As mentioned earlier, the field of view is often affected by both the magnification and the objective lens size. The higher the magnification the smaller the field of view will be. The bigger the objective lens the bigger the field of view. bigger field of view is preferred over smaller because with the bigger field of view, you are able to see a bigger area of whatever it is that you are viewing. You might find manufacturers quote two field of views that is the apparent and actual field of view. The one that actually matters is the actual field of view. This number is often quoted in either degrees, feet or meters. The eye relief is the distance your eyes should be from the eyepiece for you to see the entire field of view. This number shouldn’t be a problem for non-glass wearers but if you are eyeglass wearer, it is a feature to consider before you make a purchase. This is because your glasses will create extra distance between your eyes and the binocular eyepiece. Long eye relief is recommended for glass wearers. Binoculars with eye relief of 16mm and above should be comfortable for those who wear glasses. People who don’t wear glasses while viewing through their binoculars can get away with shorter eye relief distance but if you can’t view your binoculars without glasses at all, then you should go for longer eye relief otherwise you will lose on the field of view. You won’t be able to see the entire field of view. The exit pupil diameter is the measure of the size of the ray of light that will hit your eyes after it travels through the lens. This number determines the brightness that your binoculars will provide especially under low light conditions like dusk or dawn. This number is obtained by dividing the objective lens diameter by the magnification. The bigger the number you obtain the brighter the image will appear. Let’s take the example I used above, “8×42”. The exit pupil will be 42/8 = 5,25 mm. The exit pupil is the 5.25mm. This good for even low light conditions. The bigger this number is the matter. During the day this number isn’t that super important than at night. if you choose bigger magnification, then the objective lens should be bigger as well to give a good exit pupil. This will give you a clearer and brighter image at low light conditions. Weatherproof binoculars are favored more. Sometimes the weather can be unpredictable and the environment in which you might be using your binoculars can be harsh. Weather conditions like rain, dust, snow can damage your binos. Manufacturers often O-ring seal and use gases like nitrogen or argon to purge the binoculars to prevent fog build ups and water damage by making them water resistant. This enables you to use such binoculars in extreme weather conditions without fear that they might get damaged by water or the lens will fog up. It is particularly important to have binoculars that are waterproof and fog proof if you are using them in humid or water environments. Weight is particularly important if you are going to carry your binos around for long periods of time. If they are heavy, you will easily get tired, especially if you are walking a long distance with them. Heavy binoculars can affect your level of comfort will viewing through them with your hands because your hands can easily get tired. Luckily for us, these days manufacturers are finding ways to reduce the weight and size of binoculars just still maintaining quality. Today, you can find powerful binoculars that are lightweight but they come at a price. Lens coatings come in different degrees. The more lens coatings that are applied the better the optical quality. Lens coating is applied to ensure maximum light transmission and absorptions to reduce the reflections that happen when the lights pass through the lenses. When this is done, a brighter, clearer and sharper image is obtained. The image quality is highly dependent on the quality of the lenses and prisms used in the binoculars. These days, you will find different lens and prism coated binoculars in the market. Below are the coatings types: The more coating layers the better. In addition, anti-reflective coatings and phase correction coatings are also applied to the prisms. These coatings are applied to minimize reflections and distortions. 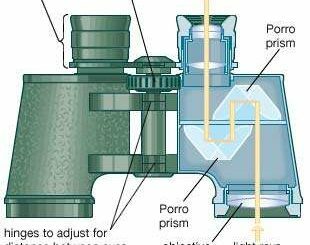 Phase correction coating is usually applied to roof prism binoculars. When it comes to hunting, binoculars is like a gun. Go to the bush without one and you are like a blind man working around in no direction. Below are my top binoculars for the money and many hunters tend to agree with me on them. Vortex Optics over the years has built a well-respected brand because of the quality of the optical devices they produce. In fact, you can’t mention some of the top binoculars brands without adding them. The Viper HD has excellent optical performance as a mid-priced binocular and it’s a great value for the money. According to users, the Vortex Viper HD binoculars have almost close to 90% clear radius before the burring becomes noticeable. With a generous eye relief of 18mm, these binoculars are ideal for both eyeglass wearers and non-glass wearers. It also has a wider field of view at 409.0′ @ 1000 yd, which will enable you to view a wider area at once. These make them great for your hunting activities. Whether you are hunting small games or bigger games, they are going to do an excellent job in the field. The chassis is made of solid polycarbonate frame which makes it somehow lightweight and can stand rough usage. It is also coated with armortek to ensure durability and easy grip with hands. The Diamondback HD binoculars are another very popular budget-friendly binoculars that are loved by many hunters. Although its optical performance isn’t the same as the Viper HD above, However, it sure also delivers great performance among its peers in this price range. It is worth mentioning that all Vortex Binoculars have a lifetime warranty. Which means if they get damaged you can send them in for repairs. The Diamondback is made of a durable aluminum body which makes it lightweight, sleek and well balance for an average person to be able to use it for long hours without fatigue. Importantly, the Diamondback lenses and prisms are fully multi-coated and phase correction coated to give you clear, sharp and crisp images. With its eye relief of 16.5mm, those who wear glasses can also enjoy using them with comfort. The Bushnell is another very affordable yet great performer among its peers in the same price range. These binoculars have an above average strong light and low light controlling performances. With it high-resolution ED prime glass and lenses which are wide-band coated. You can be guaranteed of maximum brightness when you step out with this pair for your shooting. The Bushnell legend ultra has an extra-wide field of view at 426ft/100yd and a long eye relief at 17.2 mm which is really great for everybody to use. Focusing is smooth and precise. The focus wheel is moderately stiff and easy to move deliberately without easily disturbing it accidentally. weak image resolution on the edge of the field of view. Below are my best value binoculars for the money for Safari and wildlife viewing. Having the best binoculars for your safari trip can make a huge difference in the experience you will have. They will enable you to see bigger and clearer images of the games miles away. The Nikon Monarch 7 series is the highest of the Monarch series and has the best performance of them all. It gives better images than its predecessors. The Monarch 7 also offers a great combination of price and performance. I know you might be thinking- but $500 is not small money. Considering the value you get, it is more affordable than the high-end binoculars. Weather can be unpredictable when you go on safari travel. So the Monarch 7 binoculars are nitrogen filled and O-ring sealed for waterproof and fog proof performance. You can use them in harsh weather conditions without damage. Going on Safari means to travel and hence you need a binocular that is lightweight enough to pack into your luggage but yet not give you too much extra weight. The Monarch 7 is lightweight enough just for that at just 649 g in weight. Been in the industry for many years, the Carson brand is well-known by binoculars lovers. They are also into other optical instruments like monoculars and microscopes. 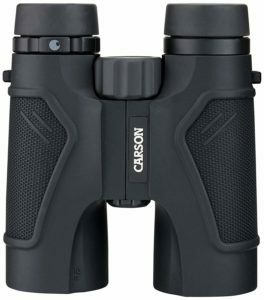 The Carson 3D high definition binoculars are good for both day and low light usage. They are able to give impressive clear and sharp images. Their rugged and waterproof design ensures that even if you drop them or the water touches them, you can still pick them and use without a problem. According to Carson company, they also come with No-fault and no-hassle warranty. Which if the get spoiled for whatever reason you can return them for repairs or replacement free of charge. They have a good field of view and a generous eye relief to accommodate both glass wearers and non-glass wearers. Looking for best binoculars under 100 dollars for your wildlife, camping, traveling and safari watching?. Then the Eyeskey binoculars will be a great fit for you. This Eyeskey binoculars give you a closer look at the world and serve you well in all environments because they are waterproof and fog proof protected. They produce clear images at this price. This is because their lenses are fully dielectric multi-coated to increase light transmission and prisms phase correction coated to enhance imaging resolution and contrast. You can enjoy magnified views of distance wildlife, birds, sports events and other activities. The chassis which is made of magnesium alloy makes them lightweight and durable for you to pack into your bags and leave to any destination. They are easy to hold with your hands or mount on a tripod if you wish. Birding watching is indeed a fun experience if you have the right pair of birding binoculars with you. Here are some of the top binoculars to give you great experience and value for your money. 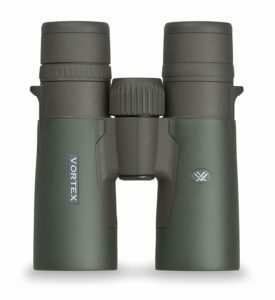 The Vortex Razor HD is a premium binocular with a premium price but very much worth the money. As you may already be aware that binoculars quality directly correlates to their prices. Even though you can get decent binoculars at an affordable price, but if you really wish for excellent optical performance, then be willing to spend a bit of money. 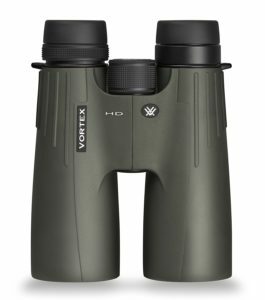 Currently, Vortex Razor HD binoculars are offered in 8×42, 10×42, 10×50 and 12×50 versions, but this review covers only the 42-mm models. 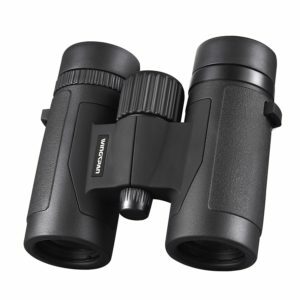 This is because the 8×42, 10×42 models are the most popular among all the binocular models and they are the standard in the bird watching fraternity. I must confess I like the Razor binos design. They are smaller weighs only 26.7 oz, are sleeker and more appealing to the eyes. 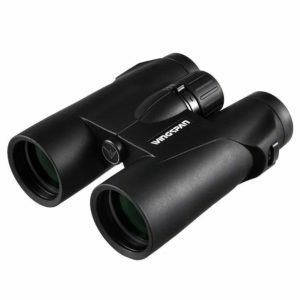 The Vortex Razor binoculars 10×42 model is lightweight and durable. This is because Vortex used magnesium for its body construction. With its exceptional sweet spot, the chromatic aberration is very minimal and unnoticeable. It has about 95% clear radius in the sweet spot. Vortex Razor HD binoculars feature a field of view of 388 feet at 1000 yards on the 8x model and 362 feet on the 10x version. That’s about an average field on most 8×42 models but it’s really very good on the 10×42. Eye relief on the 8x model is 17.5 mm, perfectly adequate for most people’s needs; that of the 10x model is 16.5 mm which is also great. The Nikon Monarch 5 series is an upgraded version of the Monarch 3 series and right below the Monarch 7 series binoculars. The Monarch 5 features extra-low dispersion glass and highly reflective fully multi-coated lenses and prisms for more sharper, brighter and clearer field of view. These binos are designed to be non-slip and have durable rubber armored body to withstand heavy abuse in any condition. They are also easy to carry and use in versatile ways for many applications. Wingspan Optics is an American brand that specializes in birding binoculars. This brand is exclusively making binoculars just for the bird watching lovers. 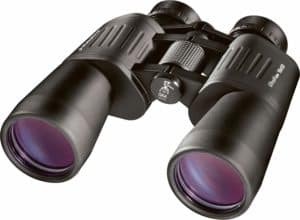 However, just like any binoculars, you can also use them for general activities like hunting, hiking, sports events, travel and among other activities. 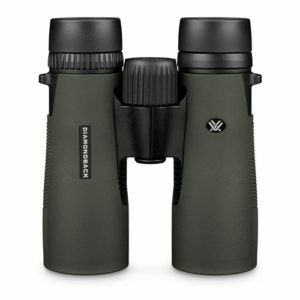 With the extra wide field of view at 420ft/1000yds, close focus, phase correction coated prism and the extra-low dispersion glass, the Thunderbird is giving a new level of clarity and brightness for bird watchers. It also has a better chromatic aberration control that gives a cleaner and clearer image. These birding binoculars have a very generous eye relief at 22.5 mm, which makes them great for those who wearer glasses as well. The Thunderbird binoculars are also nitrogen purged to be waterproof and fog proof to be able to withstand tough conditions and rough environments. Plus, they also have a lifetime warranty. Meaning in times of damage, you can send them back to Wingspan Optics for repairs or replacement. The Wingspan Optics WideViews HD as its name suggests is specially made to have an extra wide view feature which is what every birder wants. To be able to capture a wide target area at once and see more details in one view. Especially birds that are flying. 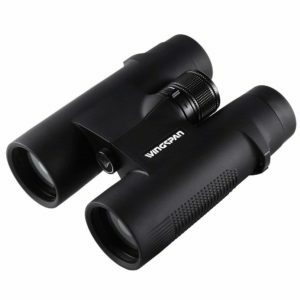 This bird watching binocular has a wide field of view of 430ft/ 1000 yards which gives you more coverage area through your binocular and is just slightly wider than the Thunderbird pair above. 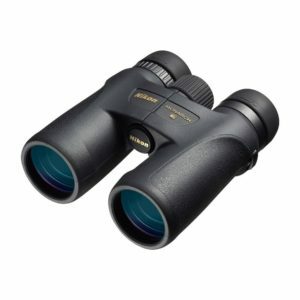 Plus, with this amount of field of view, it is greater than other typical binoculars in this price range. The WideViews binoculars have sharp optical quality thanks to its fully multi-coated lenses and phase correction coated prisms. You are able to get a sharp and clear view through them. They are also made to be fully weatherproof to protect against tough weather conditions. Additionally, they also have a lifetime warranty and guaranteed 30 days money back if you are not happy with them. If you enjoy watching the milky way and all the other planetary bodies in the sky, then a telescope and a pair of binoculars are a must have to be able to enjoy your stargazing. Below are some of best budget binoculars for stargazing and astronomy. If you really mean your astronomy and stargazing business, then you will definitely know that the size of the binocular matters. The Celestron SkyMaster weighs a whopping 156 ounces. This means that you definitely need a tripod to mount them on in order to be able to see amazing images through them. Holding them by hands and using is almost impossible. Because they are heavy. With it’s 100 mm objective lens size it is able to gather lots of lights from distant objects for you to see very clear images far away. It also has good enough eye relief for both glass wearers to also able use. Binoculars that have optics coatings always give the best images. The Celestron SkyMaster is no exception. Its optics are fully multi-coated to ensure you get a sharp viewing. The protective rubber covering used on the body ensures that you can have a firm grip of the Skymaster when in hands or while mounting it. The Orion UltraView wide angle binoculars come highly recommended for beginners and even pros. 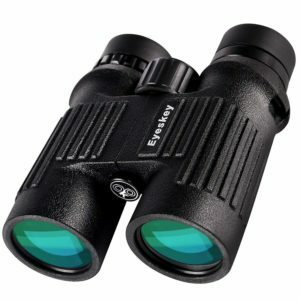 They are one of the best astronomy binoculars for the money. with just under $150 you would be seeing clear pictures of distant away objects. Most astronomy binoculars are often Porro prism type binoculars. This pair uses a Bak-4 prism and fully multi-coated optics to deliver crisp, sharp images in even low light conditions. Which is why they work really well at night when you are looking through them. They are also known for their wide angle of view. Which allows you to see a wide area at once. If you are a person who wears eyeglasses, you know how important it is to have long eye relief binoculars. Luckily, these 10×50 astronomy binoculars are made also with you in mind. With an eye relief of 22mm, you can enjoy using them without straining your eyes to have a full field of view. Its rugged cast metal alloy chassis can stand up to your field us and the rubber armored body is to ensure you have a secure grip. 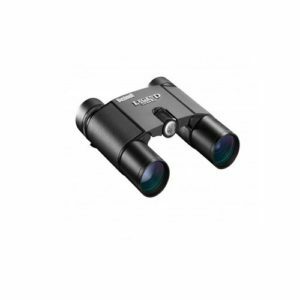 If you are really on a very low budget yet seek to explore the skies with a pair of binoculars, then the Celestron SkyMaster 20×80 binoculars will work fine for you. 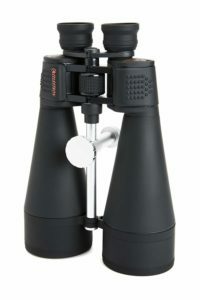 This pair of binoculars is a well-balanced one in terms is weight, size, and optics for its price range. It offers more value compared to other devices which fall within the same price range. The Celestron binoculars come with an amazing warranty. You basically get a lifetime certificate saying that you can fix all the broken parts of the binoculars for a small fee as low as $25. Another amazing thing about this device is the fact that it does an excellent job at enhancing celestial objects. Just as the name suggests it, it’s for the skies and terrestrial viewing. Compact binoculars come in handy if you just want to step out in the daytime or go for that concert without holding anything heavy in your hands. Most compact binoculars are easy to slip into your pockets without haven to carry a bag. But compact binoculars come in different sizes. Below are some of the Best Compact binoculars for the money on the market. The Zeiss Terra ED pocket binocular is one of the best Compact binoculars for the money. As we all know Zeiss is a well respected international brand from German that manufacturer premium quality binoculars. With one of the widest field of view and closest minimum focus distance, this binocular has the qualities of full-size binoculars in a compact size. Under extreme conditions, you can count on this binocular because they are made to be weatherproof. This makes them a reliable companion when you step out for activities such as bird watching, sports events, nature viewing, traveling and other outdoor activities except for astronomy and marine applications. With such a small weight as small as 320g, you can easily transport them anywhere you go. Zeiss’s transferable, limited lifetime warranty covers defects in workmanship or materials for the life of the product. 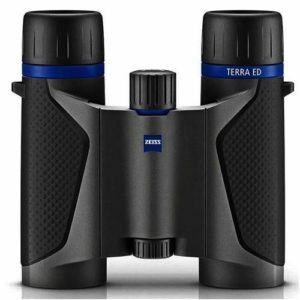 The Zeiss Terra ED Pocket binocular is available in 8×25 and in 10×25. Both models are almost the same size, shape, and weight. 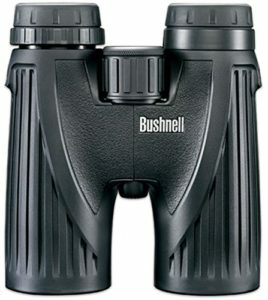 The Bushnell legend ultra HD is according to Outdoor life is a “Great Buy” award winner binocular and all reviews seemed to concord to this. This binocular is lightweight and compact and can easily fit into your pocket where ever you go. Thanks to its magnesium chassis and soft touch grips. It features low dispersion prime glass, ultra wideband anti-reflective fully multi-coated optics and Bushnells PC-3 phase coated prisms. This gives you crystal clear viewing. The ED glass lenses offer an outstanding level of viewing performance providing amazing color rendition, enhanced resolution, and vivid contrast while virtually eliminating chromatic aberration and color-fringing. The Bushnell Legend compact binocular is also made to be fully weatherproof and has the benefits of RainGuard HD. RainGuard HD water-repellent lens coating causes moisture from rain, snow, sleet, and condensation to bead up and Scatter less light. This is one of the best compact binoculars which offer great value for your money. At just less than $100, The Wingspan Optics Spectator compact binoculars are great for hunting, birding, sporting events, and other outdoor adventures. With over 1,000 customer reviews and been rated 4.6 out of 5 stars on Amazon, it is an indication that majority of the customers are happy with their purchases. They have quite a good field of view for you to capture enough area at once. Their eye relief is at 14.8 mm which is below the optimum recommended eye relief for those who wear glasses. So those who wear glasses may compromise a little on the entire field of view if they choose to go with this pair. They are made to be tough and durable and are easy to carry anywhere. They can be mounted on a tripod if you wish to but not really necessary. Ergonomically, they made to be non-slip. So you can safely hold them without fear of dropping them. They offer a lifetime warranty as well as 30 days money back on your investment just like any of the Wingspan Optics binoculars. They fit easily into a pocket. 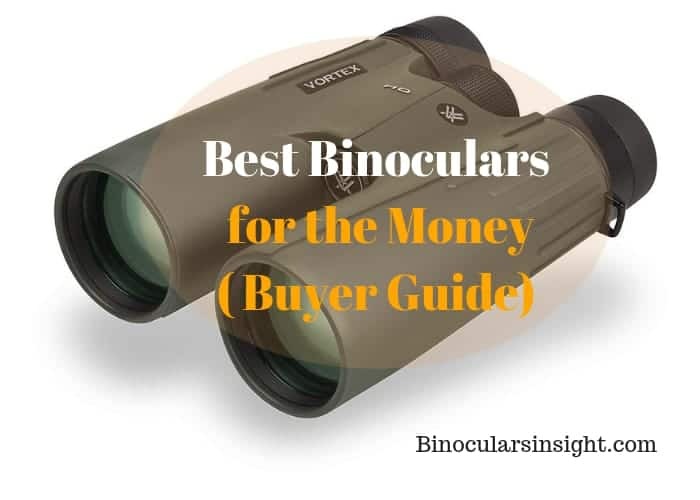 When it comes to choosing the best binoculars for the money, you have to take into consideration the quality, the weight/size and your budget. Binoculars come in different sizes and shapes, it is up to you to know what you really want out of your binoculars before you start your search. Otherwise, you will end up getting more confused because there are many brands with different models on the market. 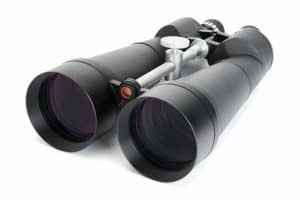 To help you narrow down quicker and save yourself time and energy, that is why I did days of research and collected customers feedback to be able to bring you these featured above binoculars. Whether you have enough to spend or you are really on a very tight budget, I found binoculars for a different price range that you will like. There are best value binoculars for the money for every need, whether is hunting, bird watching, astronomy or stargazing, compact or wildlife and safari travel. I hope you found this post to meet your needs to find the right binoculars for your money. 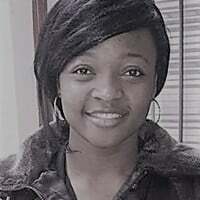 God a brand or model that wasn’t included but you think is a really great value, you may share in the comment box.